Skip to next paragraphBut there have been serious questions about how much the surgery actually helps patients with back pain and whether surgeonsÕ generous fees might motivate them to overuse the procedure. Those concerns are now heightened by a growing trend among some surgeons to profit in yet another way Ñ by investing in companies that make screws and other hardware they install. The parts can be highly profitable. A single screw that goes into the spine, for example, sells for about $1,000 Ñ at least 10 times the cost of making it. Within the medical device industry, it has been well chronicled how companies use consulting ties and other financial relationships to try to gain favor with the surgeons using their devices. But critics are especially troubled by the emerging trend in spinal devices, which so far has occurred largely under the radar. DoctorsÕ taking significant ownership stakes in spinal parts makers, critics say, provides an extra financial incentive for a doctor to recommend a surgery. It may be one of the most distinct examples yet of the way monetary considerations can play a role in the way doctors practice medicine. Such doctors face Òan awfully pernicious conflict of interest,Ó said Dr. Richard A. Deyo, a physician and health services professor at the University of Washington in Seattle. About 30 start-up companies have begun selling spinal devices, including screws, in the last couple of years. And industry experts say about a dozen companies have doctors among their investors. Because most of the companies are private and the relationships are not publicly disclosed, there is no way to know how many spine surgeons around the country are partial owners of device makers. Typically, patients are not aware of the doctorÕs financial interests. One patient who is suing her surgeon for malpractice learned only during the legal discovery process that her surgeon had a financial interest in the maker of the artificial disk he installed in her spine. Federal regulators have voiced concerns about the growing popularity of the investment arrangements, which would potentially violate antikickback laws if doctors receive stock or are otherwise compensated to use or recommend certain devices. Some spine surgeons are also concerned about whether they and their colleagues should enter into such arrangements. ÒThese are, I believe, unethical and bias the doctorsÕ choice for what is best for the patient,Ó said Dr. Charles D. Rosen, a spine surgeon at the University of California at Irvine, who is the president of the newly formed Association of Ethical Spine Surgeons. The group has about 75 members so far, who have agreed not to invest in companies whose devices they use. But doctors who do sometimes use the products of companies in which they invest say they do not let financial interests influence their medical judgment. Some surgeons and companies say that patients can even benefit because the collaboration means the devices have been better designed to meet their needs. But industry experts say that that doctorsÕ financial needs may be also be a big motive. As surgeon fees have fallen over the years, doctors have been increasingly attracted to other sources of revenue, said Dr. John Cherf, an orthopedic surgeon in Chicago who also advises hospitals about health care trends. That is why many surgeons have invested in specialty hospitals, he said. One of the fastest growing companies is Allez Spine, of Irvine, Calif. It was founded on a business model that called for the 120 doctors who invested in Allez to serve as Òits customer base,Ó according to a lawsuit filed by a former chief executive last April. Those doctors, who pay $50,000 or more to become investors, own two-thirds of the company, according to legal filings. Selling the companyÕs screws to its Òinvestor-doctorsÓ was a way to Ògenerate more profits for the companyÓ according to a related lawsuit involving the former executive. At one midsize Nevada hospital, a surgeon who performs many spinal fusions is an Allez investor who uses the companyÕs screws, said an administrator. He spoke on condition of anonymity because the hospital fears alienating its surgeons. While some doctors at the hospital who invested in Allez choose not to use its screws, others seem Òfinancially drivenÓ to select them, he said. The identities of most of the surgeons who invest in Allez are not publicly disclosed. And the doctors who could be identified and were called for comment did not return repeated telephone calls. Dr. Edward Geehr, president of Allez Spine, said that many of his surgeon-investors did not use the companyÕs products, although he declined to say how much of the companyÕs sales came from surgeons who were not also investors. The company offers hospitals products at lower prices than the competition, Dr. Geehr said, although he declined to discuss specific pricing. The spinal device market, which has doubled in the last three years, is particularly attractive to newcomers, said Stan Mendenhall, the editor of Orthopedic Network News, an industry newsletter. 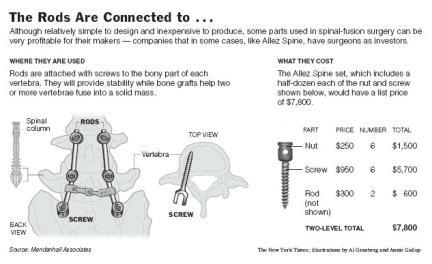 Spinal screws are relatively simple to develop and cost only $65 to $100 to make, he said, often by a supplier that handles the production of screws for a variety of companies. There are about 100 companies in the spinal devices field, and some of the newest and fastest growing have some level of doctor ownership, Mr. Mendenhall said. Patricia Kennedy had a disk-replacement operation that she said was unsuccessful. She is suing the surgeon and the maker of the artificial disk. Patients who find out about these ties can be upset, as was Patricia Kennedy, whose disk-replacement operation in September 2002 was performed by Dr.
Richard A. Balderston, a spine surgeon in Philadelphia. Ms. Kennedy says the surgery was unsuccessful and made her condition even worse. She is now suing Dr. Balderston for malpractice, and the maker of the artificial disk, Spine Solutions, for product liability. Ms. Kennedy says she did not fully understand that the disk was experimental. She discovered only later that Dr. Balderston was an investor in a venture capital fund that owned Spine Solutions at the time of the surgery. A lawyer for the company declined to comment. The company and the doctor Òfailed to disclose that Dr. Balderston had a significant financial interest in the outcome of the experiment,Ó according to the lawsuit. ÒIÕve really been guinea pigged and betrayed,Ó Ms. Kennedy said in an interview. A lawyer from the firm representing Dr. Balderston said the firm had a policy of not commenting on pending litigation. The case is expected to go to trial in March, according to Ms. Kennedy. Even hospitals where spinal-fusion surgeries are performed may not know when doctors own a piece of a device maker. A few hospitals, though, require the device makers and doctors to tell them about the arrangements. At Hoag Memorial Hospital Presbyterian in Newport Beach, Calif., several doctors are investors in Allez, including Dr. William Dobkin, a surgeon at the hospital. He did not return repeated calls for comment. ÒWe use heavy disclosure practices with our vendors and our physicians to understand these relationships,Ó said Jennifer Mitzner, the chief financial officer for Hoag. At the Tenet Healthcare hospital chain, the California hospitals it owns have signed a contract with Allez that calls, among other things, for the doctors to agree to disclose any ownership interests to their patients. Allez says physicians who invest in the company and use its products in California disclose those ties to patients. ÒAll our relationships are disclosed,Ó Dr. Geehr said. Some of the new companies aim to recruit surgeons who perform a high volume of back operations, according to doctors who have been approached. The exact nature of the investment opportunity is left vague in the discussions, the doctors say, with details made available only to those who agree to become investors. One surgeon described being contacted by Globus Medical, a start-up company in Audubon, Pa. The surgeon said he was not persuaded to use Globus screws and other hardware, despite the sales representativeÕs mention of the Ògood opportunitiesÓ available if he were to become a large user. The policies of Globus forbid its representatives from offering stock to reward surgeons who use their products, said Dave Demski, chief financial officer of Globus. The doctors who do invest, Mr. Demski said, are doing so because they are interested in owning stock in businesses they understand, like Globus. ÒItÕs really based on their enthusiasm for what weÕre doing,Ó he said. At Alphatec Holdings, a company in Carlsbad, Calif., doctors are shareholders because they have either invested directly or are paid in stock for consulting, according to filings by Alphatec, which is one of the few publicly held companies among the small start-ups. The chairman of AlphatecÕs scientific advisory board is Dr. Stephen J. Hochschuler, a prominent surgeon who helped start the Texas Back Institute, one of the largest spine clinics in the country. For his work as an adviser, Dr. Hochschuler received a restricted stock grant that was worth about $640,000 when Alphatec went public in June, according to the companyÕs public filings. Because the share price has fallen, the grant Ñ which vests over five years Ñ is currently now worth only about $270,000. Dr. Hochschuler, in a written response to an interview request, said doctors should work closely with device companies like Alphatec. ÒSurgeon involvement in the development of surgical devices is paramount in the creation of these devices and techniques that allow our patients to return to their lives in a more timely fashion, with less pain,Ó he wrote. An Alphatec spokesman also said physicians played an important role in developing new products. ÒThere is a critical relationship between physicians and engineers at Alphatec,Ó said the spokesman, David Schull. Some surgeons who have bought Alphatec stock argue that their holdings are no different than their investments in any other company. Dr. E. Claiborne Irby Jr., a surgeon in Richmond, Va., who invested in Alphatec before it went public, says he uses its devices, but not exclusively. ÒI donÕt change anything I do because of any kind of investment,Ó he said. But federal regulators and law-enforcement officials are on the lookout for surgeons who step over the line. Doctors Òare supposed to make the decision based on the best interest of the patient,Ó said Peter Winn, a lawyer in the United States attorneyÕs office in Seattle, who has aired his concerns in a speech to spine surgeons.